It should be this one. Read it. Then pass it on to every American you know who might possibly give a wit. And then pass it on to all those you know who obviously do not. In this Republic tyranny should not be stood for. I came across the website Five Books today. The gist is this: every day the website interviews one politician, scholar, or pundit by asking them to pick the best five books on their self-selected "specialty subject" and explain why these five books ought to be read by the broader public and how these books influenced their personal or scholarly view of the chosen subject. Interview w. Governor Mitch Daniels. Five Books. 4 July 2010. Interview w. Brick Lindsey. Five Books. 15 August 2010. Interview w. Rod MacFarquhar. Five Books. 22 June 2010. Interview w. Peter Paret. Five Books. 4 August 2010. Interview with Mike Maclay. Five Books. 9 July 2010. This month Slate has published an unusually thoughtful series on America's rising income inequality. The series comes in ten segments, all penned by Slate columnist Timothy North. I recommend the series to my readers without reservation, and note that Mr. North's sections on the United State's education system, immigration, and the long decline of American labor unions are of particular worth. His section on executive compensation and the financial sector is befouled by an err common to liberal pundits: North places much of the blame for the finance industry's skewed incentive structure on the industry's deregulation, a culprit not half so villainous as the Federal government's many interventions to reduce risk and assume losses (the Mexican bail-outs, Greenspan's artificially low interests rates, the nationalization of AIG, etc.) on the behalf of major industry players. The failure to take this American proclivity for "privatizing gains and socializing losses" into account is by far the greatest weakness of Mr. North's arguments. Despite this oversight, it is a series well worth the reading. Citizen Vigilantism: The Next Step in Mexico's Drug War? CBS News. 22 September 2010. CIUDAD JUAREZ, Mexico – Mexican authorities say a mob has beaten two alleged kidnappers to death in the northern border state of Chihuahua. Chihuahua state prosecutors' spokesman Arturo Sandoval says dozens of angry people in the town of Asencion beat the two men Tuesday until federal police intervened. Sandoval says officers put the men in their patrol car but the crowd blocked them from leaving and the men died of their wounds inside the car. Residents shouted at the federal officers and held signs that read "We are tired, fed up with kidnappings, no more kidnappings in Asencion." Local state lawmaker Alejandro Lebaron says the two men and three others are suspected in the kidnapping of a 17-year-old girl from Asencion. This is either very good or very bad news. Vigilantism is not a new feature of Mexico's drug war. However, most "vigilante" killings are indistinguishable from the inter-cartel murders that plague Northern Mexico. Vigilante is an attractive title for any hit-man who must legitimize his crimes. This case is different. The communal nature of the killings gives us little reason to suspect that these mobsters were in the employ of a cartel. This in itself is hardly cause for celebration: that the citizens of Asencion did not trust their government to mete out justice is a testament to just how far the Mexican state has decayed. On the other hand, if the citizens of Asencion are correct, and Mexico's federal government is truly too far gone to quell the chaos of the cartels, mobbery may be Mexico's last hope for salvation. Absencion has set a template for communities across Mexico to follow. It does not matter who you are or where you come from. In America, if you study long enough and work hard enough you can become anything. Every American child has heard this story. It is a shame it is not true. 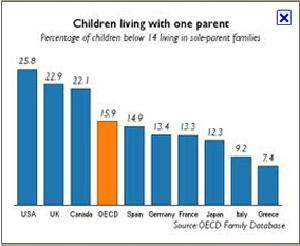 OECD, "A Family Affair: Intergenerational Social Mobility across OECD Countries" in Economic Policy Reforms: Going for Growth 2010, Part II (Paris: OECD Press, 2010). p. 7. 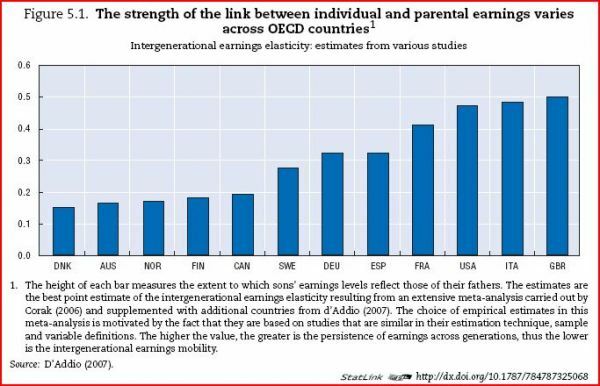 The graph above displays the relationship between the income of any one individual and the income his or her parents across OECD member countries. This is one of the strongest indicators of social mobility. If the division of wealth within a society was truly proportional to the merit of those possessing it, the strength of this relationship would be weak, even non-existent. Those born into poverty would be able to work their way out of it; those born with riches would lose their wealth if they did not work to maintain it. This relationship is not weak in the United States. A poor man living in Denmark, Australia, Canada, Sweden, Germany, Spain, or France is more likely to die rich than the corresponding poor man in the United States. Likewise, the American born rich is more likely to stay wealthy his entire life than his counterparts in all OECD countries except Great Britain and Italy. 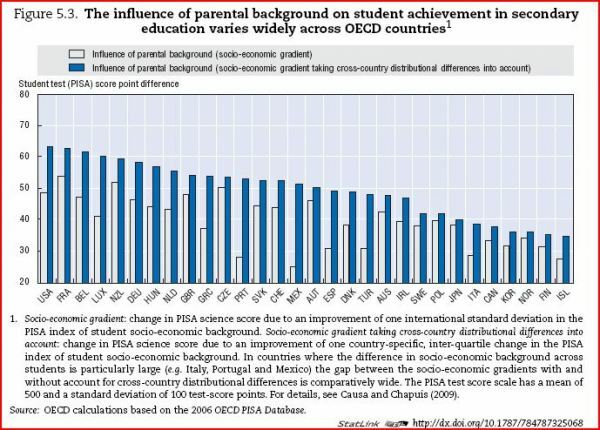 If American society was at all egalitarian the OECD study would give little cause for alarm. Alas, American society is not egalitarian; the United States is notorious for the enormous income disparity found between its upper and lower classes. This disparity has solidified over the last 30 years; over this time the annual income of the upper class has increased exponentially whilst lower class income has stagnated. As the American upper class is the clearest beneficiary of the country's plummeting economic mobility and rising income disparity, there is a strong tendency to explain these trends by examining the policies pursued by American elites. This approach is of limited utility. While I do not dispute that the upper class has actively sought to solidify its position at the front of the trough, those who focus entirely on the actions of the elite miss the deeper structural faults that keep America's underclass mired in a poverty trap. Even if elite manipulation was nonexistent these structural faults would pose a challenge of awesome proportions. Dylan Mathews, "Research desk investigates: How does college explain unemployment numbers, but not inequality? ", Washington Post, 12 August 2010. 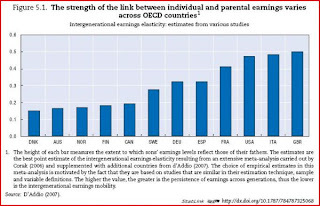 OECD, "A Family Affair: Intergenerational Social Mobility across OECD Countries" in Economic Policy Reforms: Going for Growth 2010, Part II (Paris: OECD Press, 2010). p. 10. Dan Lips, Shanea Watkins, and John Fleming for the Heritage Foundation, "Does Spending More on Education Improve Academic Achievement? ", 8 September 2008. 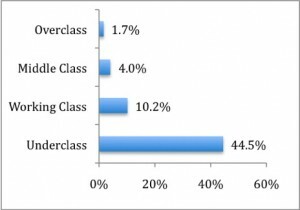 Charles Murray, "When It Comes to Illegitimacy, We’re Living in Separate Worlds: An Update on the White Underclass", American Enterprise Blog, 14 May 2010. (Data set here). Jerome Cukier, "Home Alone", OECD Factblog, 10 March 2010. National Marriage Project. The State of Our Unions. Ed. Bradford Wilcox (Charlottesville: U of Virginia Press, 2009). p. 97. Cassandra Cantave and Roderick Harrison for the Joint Center for Political and Economic Studies, "Family Income", August 1999. (Last updated December 2007). Wealth is a matter of education. 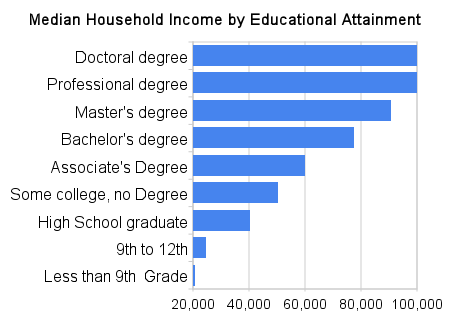 High school graduates will make twice as much as the average high school drop-out. Thus a phrase that is becoming popular among inner-city education programs: "You will not be poor if you graduate high school and don't get pregnant before you graduate." 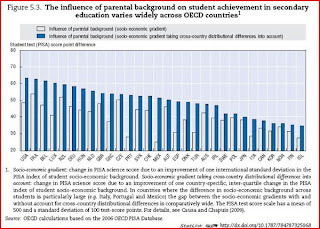 However, in the United States there is a strong relationship between school performance and class background – stronger than that found in any other OECD country! In America the children of drop-outs will in turn drop out and the children of Honors graduates will in turn receive Honors Degrees. This relationship between class background and student educational success is THE reason for America's poor economic mobility. Thus explaining America's poor economic mobility means explaining the relationship between class background and student educational success. Raising college tuition costs account for much of the difficulty found in jumping from the middle to the upper class. America's poorest must jump different hurdles. Their challenge is not paying for Bachelors and Masters degrees, but graduating from high school in the first place. What accounts for poor student performance in the high school setting? The answer to this question is unsatisfying: there is a great multitude of factors, far too many to be adequately summarized here. However, the clearest predictor of student performance (other than social class) is family structure and stability. Students from stable mother-father households are more likely to succeed in both the elementary and secondary school settings than peers from alternate family structures. Significantly, this holds true even when race, class, and other variables of this type are adjusted for. This is intuitive. A single mother working two minimum wage jobs has little time, energy, or money to spend on the education of her children. Less obvious is the corollary: if the mother must work to provide for her children she has little time, energy, or money to spend on her own education. Thus the second part of the dictum, "You will not be poor if you graduate high school and do not get pregnant before you graduate." Caring for children without the institutional support provided by a stable marriage is a poverty trap. It follows that both illegitimate births and the age at which a mother first has children should be clear markers of social class. This is largely true. In the 1980s illegitimacy rates among white women who never received more than 12 years of education and who's family incomes were less than $20,000 prior to the year of birth approached 45% – more than 20 times the rate among the white elite. At the time the total illegitimacy rate among the white population was 11%. Today it is 28%. Charles Murray estimates that the illegitimacy rate has risen to 40% and 70% for today's white working-class and underclass respectively. And this is just with whites – among the African-American and Latino populations both rates are higher. Data on the mean age of a mother's first pregnancy is more difficult to find. The CDC's annual "National Vital Statistics Report" is the most extensive study on this count. It does not relate wealth to the mean age of the mother at first birth, but it does relate the mean age of mothers at first birth to geographic location. 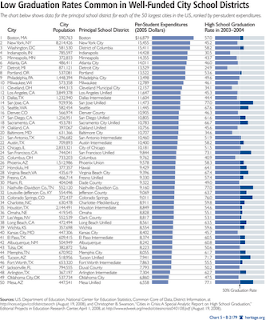 This is a useful proxy: the state with the highest median income (New Jersey) also has the highest mean age of mothers at first birth, while the states with the lowest incomes (Alabama, Mississippi, New Mexico, Arkansas, ect.) also have the youngest mothers. To summarize the relationship between education, family structure, and wealth: poor Americans are almost always uneducated men and women from unstable families. Teasing the independent variable out of this mess is nigh impossible – all three are mutually reinforcing. Moreover, all three traits are (for lack of better parlance) highly heritable. The daughter of an uneducated, low-income, single mother will become an uneducated, low-income, single mother herself. As it directly affects educational achievement and establishes the norms upon which a child will build his or her family later in life, the key to this 'inheritance' is the stability and structure of the child's family. The implications of this are worth contemplation. 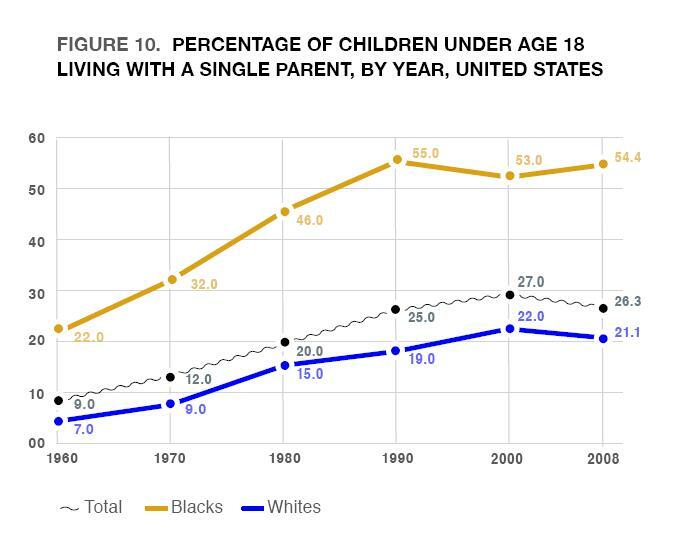 Over the last forty years the number of single-parent families in America has more than doubled. This expansion was largely an underclass matter. Thus the number of single-parent households has doubled but the median income of these households has not changed. What has changed is the potential for upward mobility among the lower class. The expansion of low-income, single-parent households has "locked" an entire generation into poverty. Pouring more money into secondary or elementary education does nothing to fix this underlying structural fault. This is the crisis of the American community. Poverty has existed throughout America's history, but only with the disintegration of the lower class family has it become a perpetual condition. The United States must now cope with all the ills that plague any polity with a permanent underclass. ...but then I found my way to the Financial Times. Within a day of the story breaking they have published ten quality articles on the subject and collected them all into one "FT in Depth" special feature. Consider me impressed. Mure Dickie. Financial Times. 15 September 2010. Chris Giles and Alex Beatie. Financial Times. 15 September 2010. This applies equally to Newsweek. On May 31st a flotilla of ships organized by the Turkish Foundation for Human Rights and Freedoms and Humanitarian Relief tried to run the Israeli blockade of the Gaza strip. As expected, the Israelis used military force to stop the flotilla from ever reaching the shore. Nine Turks died before the day was over. The following week the Turkish ambassador to the United Nations demanded that the UN mandate an international inquiry on the blockade, Turkish prosecutors charged several Israeli generals and government officials with murder, and Prime Minister Recep Tayyib Erdogan branded those who opposed to his newer muscular foreign policy as "pawns of Tel Aviv." On September 12th a series of constitutional amendments proposed by Mr. Erdogan were approved by means of a popular nation-wide referendum. With the passage of these reforms Recep Tayyib Erdogan has become one of the most important men in the history of the Turkish Republic. Only Ataturk himself has claim to higher glory. Furthermore, now having freed itself from the specter of military dictatorship and secular extremism, Turkey has shown that a people dedicate themselves to both Islamic values and pluralistic democracy. The rest of the Middle East would do good to see Ankara as its model. It is thus in America's interest to grow closer to Turkey. On this matter I am less optimistic; I fear our concern for Israel will stop us from taking the prudent course. "Major Reforms Cast as Power Grab"
Evan Hill. Al Jazeera. 13 September 2010. "New Dynamics of Turkish Politics"
Ibrahim Rahil. Al Jazeera. 13 September 2010. "Victory in Turkey Referendum Makes Erdogan Second Only to Ataturk"
Alon Liel. Haaretz. 13 September 2010. "Turkish Dailies Split Into Three Groups Over Referendum"
Hurriyet Daily News. 13 September 2010. "Western Powers Back Referendum Results"
"A grand strategy is any comprehensive strategy statesmen develop or utilize to fulfill their state's chosen national purpose." In crafting this definition I imagined myself quite original. Former Senator Gary Hart describes grand strategy as “the application of power and resources to achieve large national purposes”. Putting aside the imprecise nature of the phrase “large national purposes”, Senator Hart goes on to further explain that his idea of grand strategy “is meant to be a coherent framework of purpose and direction in which random, and not so random, events can be interpreted, given meaning, and then responded to as required” . --Colonel Joe Bassani, "Saving the World for Democracy: An Historical Analysis of America’s Grand Strategy in the 21st Century", pp. 9-10. The similarities between my own conception of grand strategy and that of Senator Hart's is clear. Once again I have lost faith in my ability to form a truly original idea. [Grand strategy is] an overarching concept that guides how nations employ all of the instruments of national power to shape world events and achieve specific national security objectives. Grand strategy provides the linkage between national goals and actions by establishing a deliberately ambiguous vision of the world as we would like it to be (ends) and the methods (ways) and resources (means) we will employ in pursuit of that vision. I have taken a great liking to this definition and will henceforth use it as my own. I have but one amendment. As argued in "Dreaming Grand Strategy" and "Addendum to Dreaming Grand Strategy" the "deliberately ambiguous vision of the world" highlighted by Colonel Bassani (less precisely named "national purpose" in my earlier writings) is a prerequisite for all grand strategies but is not "established" by them. The means by which a unifying vision is formed differs from polity to polity, changing with the historical experiences, social hierarchies, and political structures of each. However, once the decision-making class comes to share one common (if ambiguous) vision, strategies can be developed to establish the methods and means by which this vision may become reality. These strategies are grand strategies. "Grand strategy is an overarching concept that guides how nations employ all of the instruments of national power to shape world events and achieve specific national security objectives. Grand strategy provides the linkage between national goals and actions by establishing the methods and resources employed in the pursuit of a predefined and deliberately ambiguous vision of the world as a nation's primary decision-makers would like it to be." There are very few things I believe every citizen of the United States should read, hear, or see. This is one of them. The Republic stands on the strength of an informed citizenry capable of exercising oversight over their government. The government should always be an instrument in the hands of the people. As the police are the most common point of contact most people have with their government, every citizen should know how to negotiate police encounters. Start it at 5:30 to skip past the CATO Institute's introduction. EDIT: For those interested, the actual video is only 40 minutes long. The rest consists of a Q&A session at CATO. It doesn't need to be watched by every citizen in the Union. The technological growth of the last two centuries has been championed as one of capitalism's greatest triumphs. Technological innovation, however, is dependent on the invisible foot. But what invisible foot can be found in a world full of firms "too big to fail?" "Too big to fail" is attractive in the short term. On a longer scale it does not fare so well. The lost innovation on the future may cost society much more than temporary economic instability today.